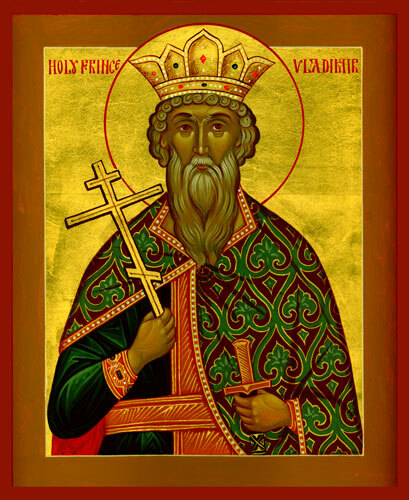 Vladimir was the prince of Kiev who converted to Christianity in 988 – and his city with him. He is thus considered the first evangelist of Russia, but is essentially a saint-hero rather than a purely religious Power. (Cynics say that his conversion was a political move, and this is why he has no secret, but they will no doubt burn in hell for their impiety.) In Kiev and elsewhere he is also regarded as a patron of all good and great Christian rulers. Abilities: Commanding Presence, Devotee of St Vladimir or Initiate of St Vladimir, Life of St Vladimir, Order People About. Virtues: Authoritative, Evangelical, Think New Thoughts. Worshippers: Princes, warriors, evangelists and proud subjects of Kiev. Disadvantages: St Vladimir cannot be worshipped through dvoeverie as well as pagan Powers. Furthermore, pagans who do not practice dvoeverie often despise St Vladimir – and by extension his worshippers – for turning against the old ways. A Time of Troubles demands a hero, and St Vladimir was one such: warrior, lover, spymaster and tsar. Born from humble stock in Leningrad, he learned the ways of the street and then of the Cheka and finally of power, mastering them all with coolly effortless efficiency. Abilities: Cold Hands Warm Heart, Cultivate Right Friends, Devotee of St Vladimir of the Kremlin or Initiate of St Vladimir of the Kremlin, Judo Master, Life of St Vladimir of the Kremlin, Obscene Slang. Virtues: Action Man, Coolly Self-Confident, Ruthless. Rites & Representations: There is but a single true icon to St Vladimir of the Kremlin, which weeps myrrh and crude oil. Nonetheless, in less holy imagery he is depicted in a range of manly and martial activities. His holy day is the Self-Annunciation, held on 4 March. 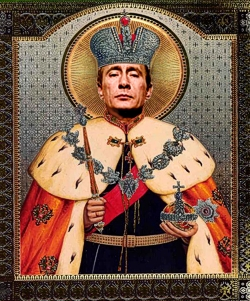 Worshippers: He is revered by functionaries, spies, thief-takers, swordsmiths and, of course, all good, loyal citizens of the modern Rus’. Disadvantages: No worshipper of St Vladimir of Moscow can follow any other saint or deity; it is unthinkable.